You might ask why there is a towering stack of butter in my kitchen glistening in the afternoon sun? It’s because I was invited to be one of the ‘Friends of Lurpak‘ bloggers, part of a new campaign LURPAK is launching to promote their product. This is what I’ve always dreamed of. A blog that yields fancy butter! There are a whole bunch of cool things Lurpak is doing for their campaign including The Lurpak Challenge . 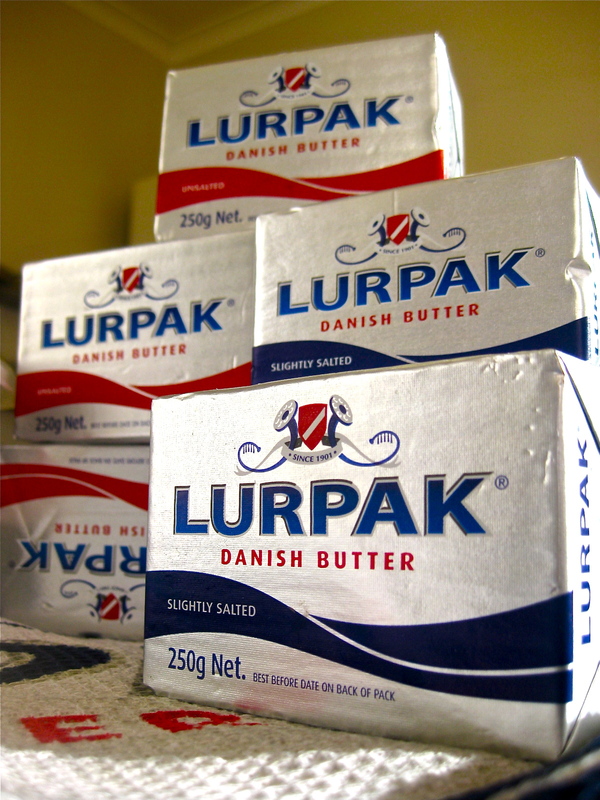 This is a competition where you make your own amazing recipe using Lurpak butter. The entries will be judged by the Friends of Lurpak bloggers and the illustrious Adriano Zumbo. Alas, I will not be able to take part in the judging due to my new London location, the power would have gone to my head anyway. There will be 5 winners who’ll each receive $1500 and their recipe printed in local Woolworths stores. For more details visit the site. So, in the meantime keep your eyes peeled for some butter-filled concoctions as I madly try and bake my through 2kg of Danish butter. Just eat it by the spoonful,it’ll be delicious just as is.